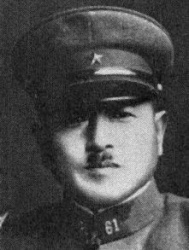 Iimura Jo was a former military attaché to Turkey and commandant of the Army War College who became chief of staff of Kwantung Army after the disastrous Nomonhan Incident. He was the first dean of the Total War Research Institute, but in spite of being a talented linguist and charismatic leader, he was unable to realize the promise of the TWRI. He was appointed commander of 5 Army in Manchuria shortly before war broke out in the Pacific. He again served as commandant of the War College from October 1943 to March 1944. As chief of staff of Southern Army, Iimura supported Yamashita's decision to cease reinforcing Leyte and begin building up defenses on Luzon. Smith (1961) speculates that Terauchi's displeasure with Iimura was the reason he was given command of an almost nonexistent force (2 Area Army) just five days later. Iimura was recalled to Tokyo in May 1945 to help with the final homeland defense.